Pre-owned Juniper MX104 routers are the largest of the fixed-configuration MX Series routers. The MX104 also has the most flexibility in terms of port configurations, allowing you to set up the router to best fit your needs. It’s best suited for enterprise and service provider networks. The specification that separates the MX104 router from other fixed-configuration MX Series routers is Modular Interface Card (MIC) slots. 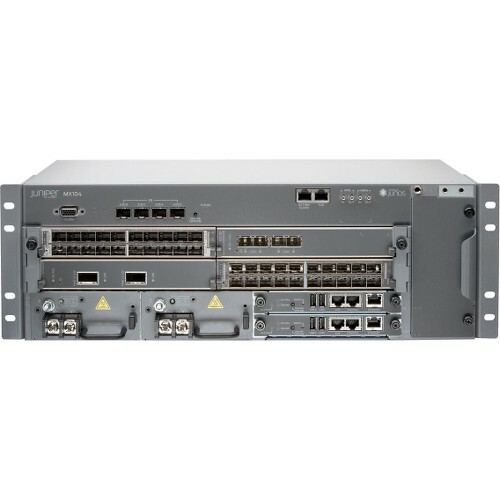 Pre-owned MX104 routers have four MIC slots, which is more than any other MX Series fixed-configuration router. In addition to having four MIC slots, used MX104 routers have four 10G Ethernet ports. The MX104 has a maximum capacity of 160 Gbps, the same as the MX80. But, despite the fact the MX80 and MX104 share that specification, pre-owned MX104 routers are nearly twice as big as MX80 routers, which allows for the greater number of MIC slots. The chart below illustrates some of the differences between the MX104 and the other fixed-configuration MX Series routers. The biggest – and most obvious – difference is its size. For more details on our in-stock MX104 routers and parts, please contact us directly. We can send PDF datasheets that include in-depth specifications you can use to compare used MX104 routers to other MX Series routers and decide which hardware will serve you best. The pre-owned MX104 routers and parts we sell are guaranteed to operate at high-performance levels right out of the box. We diligently inspect every piece of equipment we purchase to ensure it’s in great condition. Our checklist of quality control tests allows us to verify all hardware is free of any damage on the outside or the inside. Any equipment we sell must pass our inspection process. In addition to confirming our pre-owned MX104 routers are running properly, we make sure any equipment you purchase arrives quickly and securely. We use the most protective packaging materials, and used routers we buy are often in original packaging when we receive them. If you would like us to send you a quote for purchasing our in-stock pre-owned MX104 routers, please reach out to our sales team today. BrightStar Systems will help you get the most value from selling your used surplus MX104 routers by offering the best prices available. Whether you have unused equipment sitting on shelves, or you’re planning to replace your existing used MX104 routers with new hardware, we’ll pay for the equipment and cover the shipping costs. We specialize in purchasing from large-scale enterprises and data centers. With our experience, and our established logistical network, we’re able to purchase pre-owned MX104 routers in bulk from anywhere in the world. We typically receive shipments within a week, from which point we immediately test each piece of hardware to verify it’s in working condition. We can pay in advance or cut a check once we’ve verified all the equipment is up to our operational standards. 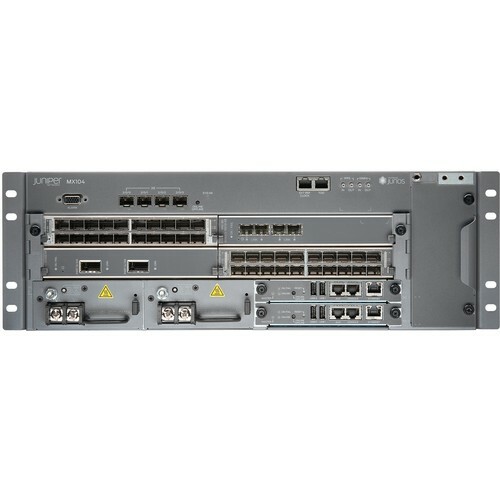 Please reach out to us if you’re interested in selling your used surplus MX104 routers, or any other pre-owned Juniper MX Series hardware. At BrightStar Systems, we like to build trust with everyone we work with. That’s why we do everything we can to offer you the best prices for buying your used equipment and selling you pre-owned MX104 routers. For every transaction, we follow a simple, straightforward process to make sure you’re satisfied. When we purchase used MX104 routers from you, we ask that you send us a list of what you’re looking to sell and we respond with an offer. From there, we nail down the final price and pay to have your equipment shipped. When we sell used MX104 routers, we ask you what you want to buy and send you a quote for those items. It’s that simple. There are several reasons to choose BrightStar Systems for all your used Juniper MX104 router needs. We’ve been in business for more than 20 years, and during that time we’ve made a name for ourselves as a reliable dealer of pre-owned Juniper MX104 routers and other used surplus Juniper networking hardware. We always provide excellent service, whether you’re a first-time buyer or a returning client. If you would like to learn more about our pre-owned MX104 routers, contact us today. We have PDF datasheets that break down the differences between all the MX Series routers we sale. And if you’re interested in buying or selling used Juniper MX Series equipment, we’ll put you in touch with one of our sales representatives to get the process started. Read more about Juniper MX104 specs with the suggested downloadable pdf datasheet. Contact us about pre-owned MX104 routers with BrightStar Systems’ 1-Year In-House Warranty.